It is no secret that automotive semiconductor customers are becoming increasingly demanding. The "under the hood / bonnet" electronics environment is arguably one of the most thermally stressful environments on the planet. Electronics close to the engine block can experience extremes ranging from frigid winter cold to tropical heat, with the added heat source of the adjacent internal combustion engine. The moisture sensitivity level (MSL) standard from JEDEC / IPC was developed to cover the moisture-absorption and "popcorning" effects of polymeric overmolded materials, but has been expanded in usage to cover a variety of different packaging situations and failure modes. The standard does allow for a certain amount of delamination, even under the MSL1 conditions usually required by automotive semiconductor customers. However, now "zero tolerance for delam" is the most common request from automotive design engineers. In order to meet this need, both overmolding materials manufacturers and leadframe suppliers have been working on how to drive to zero delamination. Leadframe manufacturers have developed a variety of approaches to their products that enhance the adhesion between the leadframe metal itself and the overmolding compound. Usually, this takes the form of physical and chemical texturing of the copper, using a process such as brown oxide formation. It is no surprise that this need for adhesion enhancement (AE) drives leadframe treatments that are antithetical to the need for formation of void-free, high conductivity electrical connections between the die and the leadframe - basically, it messes with the solderability of the preform or solder paste. 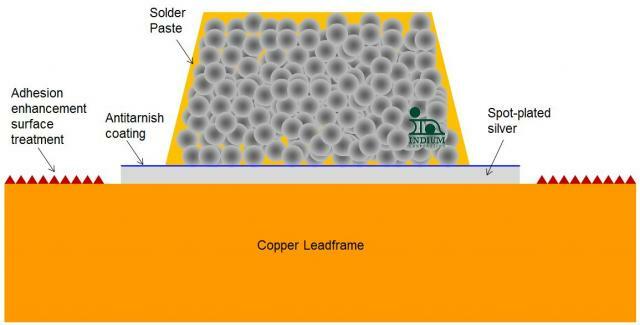 In order to get around this issue, leadframe manufacturers have increasingly moved to the use of spot-plating of silver onto copper, with thicknesses ranging from 2-9microns. Why is the silver so thick, in comparison to silver sputtering onto the die surface? Simply because copper diffuses very quickly into the silver, so a thicker silver layer leads to a longer shelf-life for the leadframe. Note also that plating does not have as good process control as sputtering, but it is a lot cheaper and faster. You can see (below) a schematic of solder paste printed onto one of these leadframes. An emerging failure mode is one of incomplete wetting onto the leadframe, leading to failures at the sites where solder has failed to flow over the silver plated area completely - "delamination sites" - (below). The flat, shiny, silver finish is not a suitable surface for overmolding compounds to bond to. So why isn't the solder wetting well? The answer becomes clear pretty quickly when you do some back-of-the-envelope calculations of the expected final silver content of the finished joint. Let's assume some bondline thicknesses (BLT) is (25,75microns) of a solder containing 2.5%Ag (such as Indalloy 151 or 163) and the plating thickness is (3-9)microns. Typical plating thicknesses of 2-9microns may be seen, based on a recent customer survey), with a mean around 3microns. So what is the silver content of the final joint, assuming all the silver is dissolved? The calculations, therefore, show that it is from 6 to 27% silver. The 27% level is well beyond the solubility limit of silver in these types of solder, and in fact in most solders, at the expected soldering temperatures. The mechanism of non-wetting is clear: solder can no longer wet onto silver, once it has become filled with insoluble intermetallic particles. Maintain the silver thickness at a consistent, low level: set up tighter specifications on the silver spot-plating from your supplier. Update your incoming quality control inspection so you can be sure you are getting what you paid for in terms of thickness of silver and consistency. Manage leadframe inventory so you run leaner, so you do not run into leadframe lifetime issues with copper diffusing through the thin silver layer and oxidizing (solderability / voiding problems). You do have an alternative (moving to an alternate solder type), but then you are into a lengthy requalification procedure. As always, please contact me if you need assistance.